CheerLights that are controlled by tweets and that change color in synchronization with all the other CheerLights around the world. The Particle Photon is a Wi-Fi microcontroller made by Particle.io. 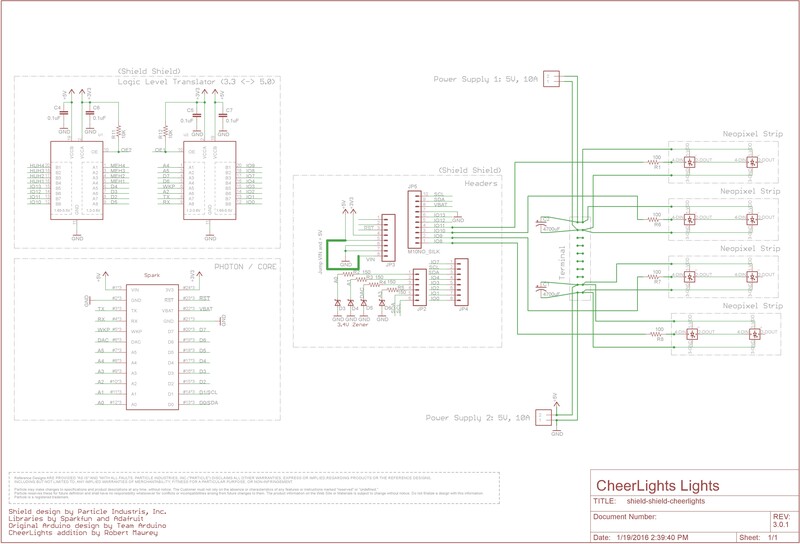 You will use the Photon to connect to your Wi-Fi network, read the latest CheerLights color from ThingSpeak, and drive the LED strips. My project used four 10 meter LED strips. The LED strips come in a maximum of 5 meter lengths and each of the four “branches” was made from two 5 meter strips in series. This is a lot of LED strips and your project can be adjusted to a small number if needed. A terminal block is used to provide a secure physical and electrical connection between the shield shield and the LED strips. 5 meter LED strips can draw up to 5A each with all the LEDs white and on full brightness. Since the sparkling LEDs are never all on at full brightness at the same time 2.5 A is enough current for each 5 meter strip. A weather proof box used to mount the electronics outdoors. Used for transient voltage suppression. Plus: Miscellaneous parts – Ethernet cable, 14 AWG wire, solder, terminals, screws, heatshrink, plywood for base. Sparkling LED lights are pretty to look at and make fun displays for holidays or special occasions. CheerLights that are controlled by tweets and that change color in synchronization with all the other CheerLights around the world add an element of interest and community that sets them apart from regular LED lights. This article explains how you can build your own sparkling Cheerlights display using a Particle Photon Wi-Fi microcontroller and LED strips that read the current CheerLights color from ThingSpeak. The electronics and power supplies are mounted on plywood sheet inside a weatherproof box. A close up picture of the Shield Shield board shows the signal connections to the four Neopixel strips. The photo shows use of a terminal header for convenience. Note the red jumper wire between VIN and 5V used to bypass the voltage regulator on the Shield Shield. Five jumper wires (not shown) are soldered beneath the board from pins IO10, IO11, IO12 and IO13 and ground to the terminal. As an alternative to using a terminal header the jumper wires could be pushed into the board headers or soldered on directly. Ethernet cable is used to connect the power and signal wires to the LED strips. The brown/brown-white twisted pair are connected together to carry ground and the orange/orange-white pair together carries +5 volts. The blue/Blue-white twisted pair is used for the signal. A 100 ohm resistor is connected in series with each blue-white signal wire. Each power supply powers two 10 meter long LED strips and a 4700 uF capacitor is mounted on the terminal strip across each power supply terminal. Note: it is important to keep the length of the signal wires less than about two feet long. The signal driving the LED strips operates at about 800 kHz and, since the drivers are unbalanced, it is not possible to send the signal down long wires without it becoming too distorted to operate the strips correctly. Follow the Particle instructions on their web site to connect your Photon to your Wi-Fi network and associate it with your account using their app or web IDE. The code is published on Github. Note that after you have copied the code to the IDE you will need to delete the two #include statements for the ThingSpeak and neopixel libraries and add them back again for the Particle IDE to actually include the libraries. If everything is working correctly your CheerLights display should gradually light up along the strips with a sparkling effect. Sending a Tweet with the hashtag #CheerLights, and a valid CheerLights color anywhere in the text, will change your display to the color that you just tweeted. Cut and paste into the Particle.io IDE. Founder and CEO of Sentient Things, Inc. Former CEO of IoT startup ioBridge.com. Thanks to Hans Scharler, Rob Purser, and Douglas Mawrey.